Herborium Group, Inc., is a novel botanical therapeutics® company focused on developing, licensing, and marketing of proprietary, botanical based medicinal products, targeting unmet medical needs. The Company responds to both consumers and healthcare professionals demand for safe, efficacious, all natural medicinal options for treatment and prevention of selected diseases and health concerns. The Company business model focuses on emerging market opportunities spearheaded by the growth of a new market sector located between high-cost, high-risk, ethical pharmaceuticals and commoditized classic nutraceuticals (supplements). The potential for this market assesses for over $125 Billon in the USA and UK alone. This new market is presently positioned for exponential growth since it represents a compelling response to changing needs of a healthcare sector. For the industry, botanical therapeutics provide a value added approach based on product differentiation, higher profit margins, and intellectual property protection with a lower risk and regulatory burden and lower cost. Nutraceuticals (supplements) face increasing FDA and market scrutiny, with massive competitive pressures. To meet the needs of this new growing market opportunity for a diverse spectrum of botanically based drugs, along with complementary and non-traditional therapies, Herborium introduces its own botanical therapeutics® defined as “bridge products”, an emerging category of natural medicines whose safety and efficacy are validated through clinical studies. 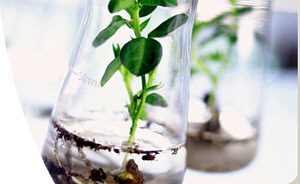 Botanical Therapeutics® represents benefits and attributes of both aforementioned traditional sectors. Botanical Therapeutics bring the intellectual property value, posology, clinical validation and rapid market entry while maintaining a safety profile of botanical ingredients and offering the benefits of preventive medicine and cost containment. For its own Botanical Therapeutics the Company uses clinical validation and a proactive regulatory strategy based on the FDA Guidance for Industry: Botanical Drug Products (FDA Guidance 2004) to establish and maintain a differential advantage. Herborium harvests its proprietary therapeutic candidates from Traditional Chinese Medicine with initial confirmatory data and utilizes Western regulatory, clinical and marketing strategies to successfully introduce the products to the Western markets. This strategy serves to mitigate risk in the product development and marketing strategies. The Company secured a pipeline of botanical ingredient based products in the areas of dermatological needs, Prostate Health (BPH), Liver Diseases, Women’s Health and selected sexual disorders resulting from cardiovascular disease, use of anti-depressants, surgical procedures, and other problems. The longer-term pipeline includes arthritis candidate and the anti-infectious product candidate focused on antibiotic resistant infections. Herborium Managements represents a unique blend of expertise with over 50 years of successful business dealings in Asia, an exceptional track record in pharmacology and drug development, clinical testing and regulatory affairs in the US and Europe, supported by high standards, know how in herbal science and formulation, and specifically Modern Chinese Medicine. Herborium presently sells its products in the United States, the United Kingdom, and continental Europe through a network of distributors, specialty retailers, and e-commerce. With initial seed investment brought to the Company by Friends and Family and a small professional round, spear-headed by Southridge Investment Group LLC, the Company is ideally positioned for exponential growth in the near future. Down economic times are actually realizing an additional pressure on the sector, and both consumers and insurance companies look for safer and more affordable healthcare options.